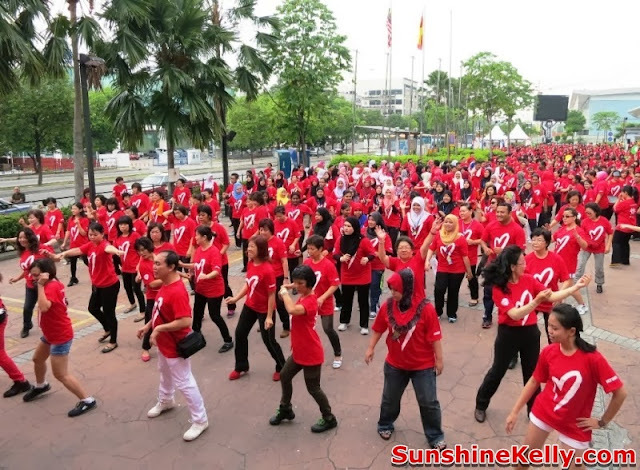 On Sunday morning, there were about 1,500 Malaysians, young and old moved and grooved to the beat in Line Dance for Healthy Heart at Mydin Mall USJ, Subang Jaya. Line dancing is fun way to exercise as it is low impact activity that can help to balance and coordinate plus improve cardiovascular health. High cholesterol levels put us at a higher risk of getting heart disease, one of the leading cause of death in the country. The key factors to high cholesterol levels are obviously our unhealthy diet, stress and lack of exercise. However, I find that mostly older generation would prefer line dance. The younger generation maybe like more strenuous workout. Anyway, as long as we do some exercise to strengthens our body and bones 3 times a week consistently is good enough be it any type of exercise. Even walking or doing house chores is better then just sitting in front of television or laptop the whole day. So get up and keep moving.